I wonder just how much legal officials understand about Justice sometimes. Americans are so divorced from any form of genuine cultural impetus that I doubt the philosophical implications are even relevant. But, I digress – let’s explain the philosophical basis of Justice – almost every courtroom in America contains an image of Justice…as an ancient Roman deity. 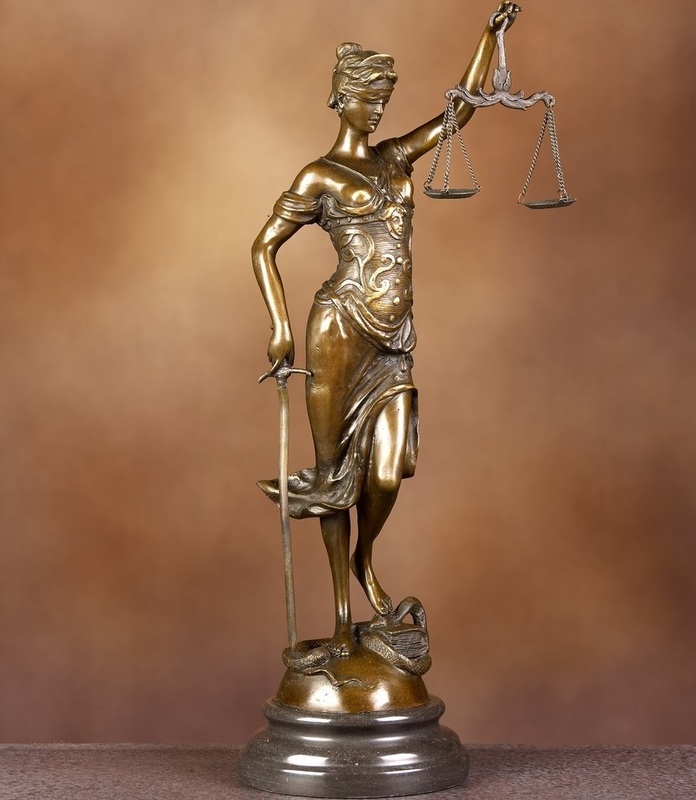 In fact, it can even be said that lawyers make their oath and swear by Lady Justice (Justia) in the courtroom. You will commonly know her as a blindfolded woman with a sword, holding scales, and standing on a snake (pictured below). Her real name is Justia, a Roman Goddess equivalent to the earlier Greek Themis (Divine Justice) and Dike (Mortal Justice). The Greeks, being more philosophical than the Romans, divided Justice into two – with Themis being the more powerful and a Titan of equal power to Zeus. Themis, the original symbol of Justice, I wager, has long since fallen out of memory to today’s lawyers. Now – let us ask – do the Gods have bureaucracy? Did they invent a system of rules wherein the highest power is a roll of almighty red tape and that the price of mortal justice is measured and brought in gold? I doubt it; bureaucracy is undoubtedly the devil’s tool and nowhere is it more profuse than in government departments. So what then is the symbolism of Justia, Goddess of Lawyers? Firstly she is blindfolded, to represent impartiality. Therefore, Justice cannot discriminate based on anything – no, not even political persuasion. Secondly those scales – contrary to what the level of current corruption in corporate America indicates – they aren’t meant to measure gold and legal bribes. One scale is to measure the heart, the other truth. This is a motif which is universal across every culture from China to Egypt – once the scale is tipped on divine Justice, it opens the gates to Hell. Thirdly, she is stepping on a snake which represents the lower elements in humanity, the lack of ethics/morality etc. The Christian and Jewish readers pouring in to capitalise on the demise of Bill White will understand that the snake represents Satan/Shaitan,and that’s where people are headed if they don’t obey Justice with the capital ‘J’. It can therefore be said that any individual in a courtroom (Themis, after over 2,000 years is still represented as the depiction of Justice in Western civilization) that anything unethical, bias, or corrupt present in a legal environment errodes the foundations of what Justice actually is. The charge of thwarting ‘Justice’, with the capital ‘J’ therefore becomes a matter that afflicts legal officials as well as the accused from the divine perspective, if a lack of ethics is presented. In Bill White’s case we are presented with: 3 counts of totally stupid sounding hoax emails containing song lyrics from someone who is clearly a prankster and 2 counts of anonymous blog comments which don’t appear to relate to anything else mentioned. That breaks down to 40 years for two blog comments and sixty years for three ridiculous emails containing song lyrics. I don’t know about you, but that doesn’t sound like an ethical or just sentence for the actual crime to me. The sentence being sought here is insane, more insane, than the three hoax emails from ‘Mr. F’ng Manson’ himself, who ever he may be. Now – could someone kindly direct me to the appropriate form to launch an appeal for common sense? It seems to be missing from the file on Bill White. ILLUSTRIOUS Themis, of celestial birth, Thee I invoke, young blossom of the earth; Beauteous-eyed virgin; first from thee alone, Prophetic oracles to men were known, Giv’n from the deep recesses of the fane In sacred Pytho, where renown’d you reign; From thee, Apollo’s oracles arose, And from thy pow’r his inspiration flows. Honour’d by all, of form divinely bright, Majestic virgin, wand’ring in the night: Mankind from thee first learnt initial rites, And Bacchus’ nightly choirs thy soul delights; For holy honours to disclose is thine, With all the culture of the pow’rs divine. Be present, Goddess, to my pray’r inclin’d, And bless the mystic rites with fav’ring mind.